How Much Power Will Mauer Keep? Joe Mauer has denied making any sort of deadline on negotiating a contract extension with the Twins, which gives both sides some breathing room. This is an important decision for the Twins. Joe Mauer is a superstar, providing amazing offense from the toughest defensive position, a fan-favorite, a local boy and the “face of the franchise.” In addition, because of the Johan Santana trade the Twins have a reputation of being cheap when it comes to keeping their stars, and they are entering an expensive taxpayer supported ball park. On the other hand what fans really want are wins, not stars, and extending Mauer could hamstring the franchise by forcing them to pay him a huge portion of their payroll to one player for many years. 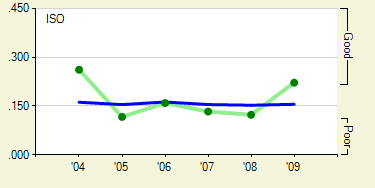 The 2004 numbers were based on just 122 PAs, so seem like a small sample size artifact . Previous to this year he had slightly below average power, which coupled with his excellent K/BB ratio and BABIP, made him a very good offensive player. But the power breakout, while keeping the amazing other numbers, made him the best non-Pujols offensive player in the game. The question is how much of that power stays. 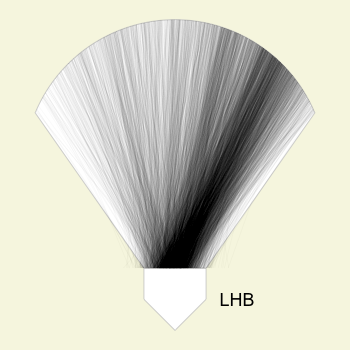 As Dave Cameron noted earlier most of his power is of the opposite field variety, an extreme rarity. 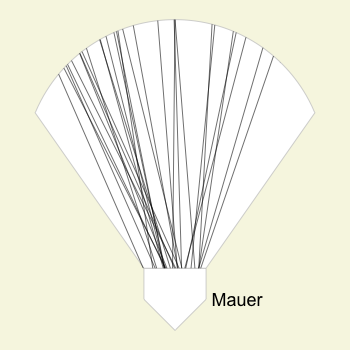 Here is a diagram of where the pitches Mauer hit for HRs crossed the plate and where he hit them in 2009. It is similar to the image I created for Adam Lind, but I incorporated some of the suggestions based on that post. The major suggestion was that the angle of line indicate the angle of the ball in play, which is not how I had it in the previous diagram. Sal Paradise incorporated these suggestions into a diagram and what I present here is close to what he did. Mauer pulls inside pitches, but takes outside pitches the other way. This is very different from how most LHBs do it. I am not sure if this extreme opposite field power and tendency to take the outside pitches the other way makes his power any more or less likely to stay. The fans, 72 of whom have projected Mauer, seem to think he will keep most of his power, projecting his ISO at .200, closer to his .222 of last year than his .156 career average. The question of how much of the new found power Mauer keeps, along with the unrelated and unaddressed-here question of how long he stays at catcher, are of the utmost importance to the Twins as they think about the extension. We hoped you liked reading How Much Power Will Mauer Keep? by Dave Allen! Greg Rybarczyk’s THT 2010 Annual article looks at the outfield dimensions of Target Field versus the Metrodome. I don’t have it in front of me so I cannot tell you what he found exactly, but I think the dimensions were pretty close with Target Field maybe being a little smaller in some places. Obviously Target field is not in a dome so the fences will not be the only change influencing HRs. It is a great article (it also looks at HRs in Citifield and new Yankee Stadium) and a great reason to buy the THT Annual. Actually, the high wall at Target Field extends much further into Right Center field, which would negatively affect power, plus the fact that most of the games will be plyed at colder then typical dome temperatures would cause fly balls to travel less, of course wind dynamics are yet to be known etc. Thanks for correcting me. I should not have shot off without having the information in front of me. The Rybarczyk article has the outline of the two outfields drawn over each other, I should have waited to go back home and look at it before commenting. If he is hitting outside pitches for power, it seems to me that he might be waiting for the ball to travel deeper into the zone and using above average bat speed to drive the ball. As his bat speed decreases with age, that opposite field power might drop. Of course, I’m sure someone with more time and better resources could check on those things (how far he allows the ball to travel in the zone, and how players with primarily opposite field power perform as they age).